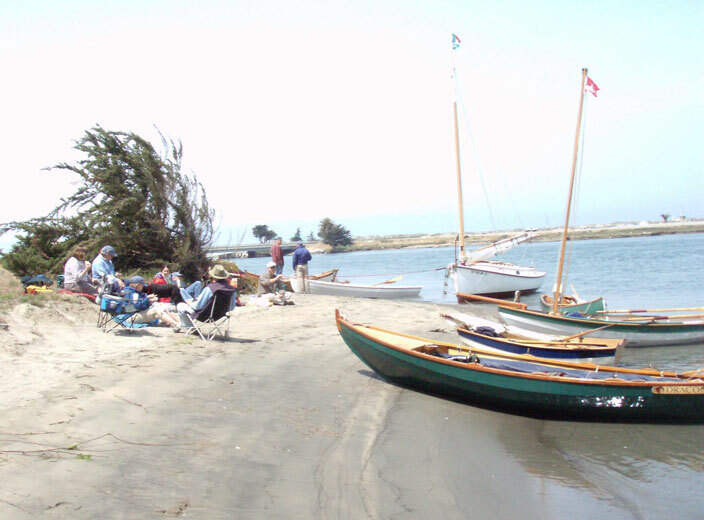 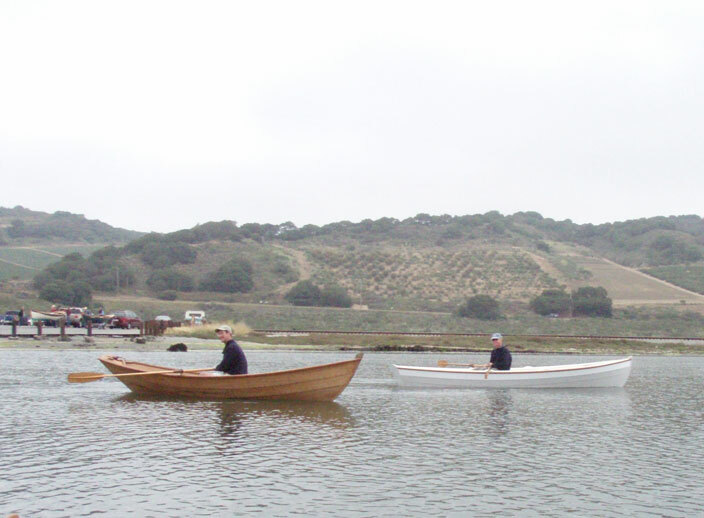 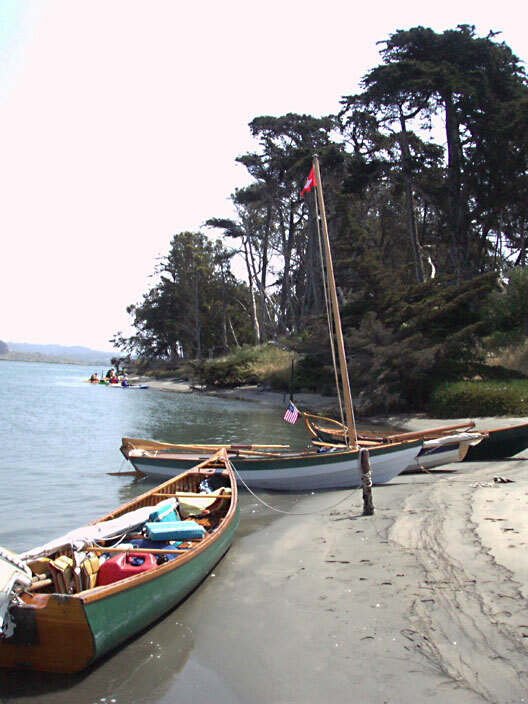 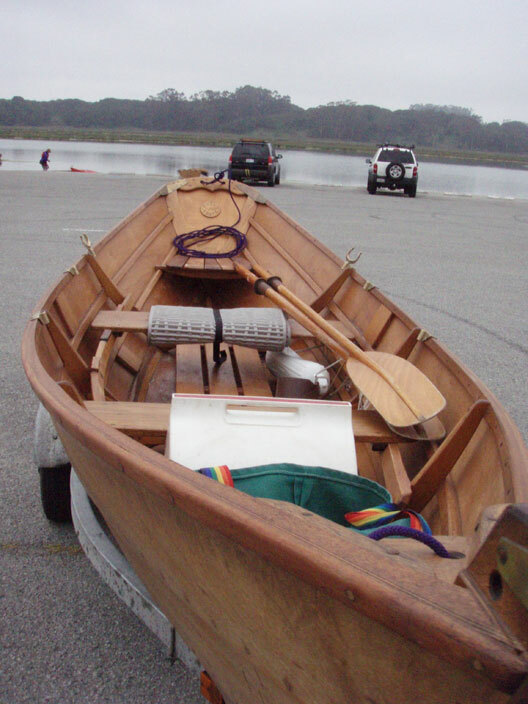 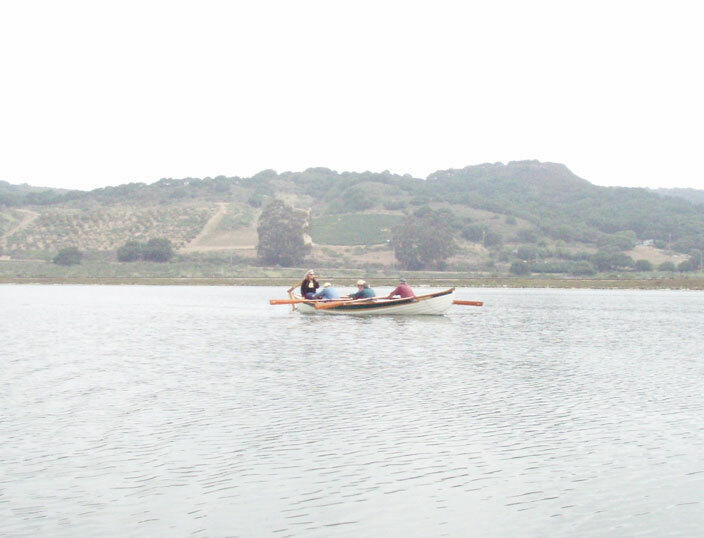 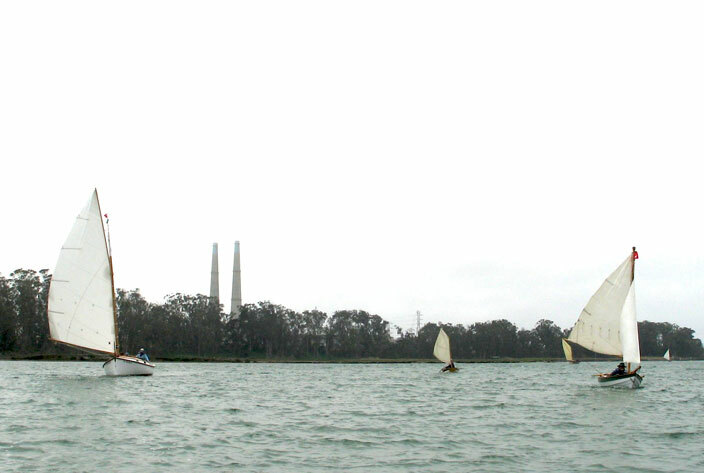 The Sac-SF TSCA chapter hosted a row from Kirbys up the Elkhorn Slough for a picnic near the ocean, with most boats sailing the downwind run back to the ramp. 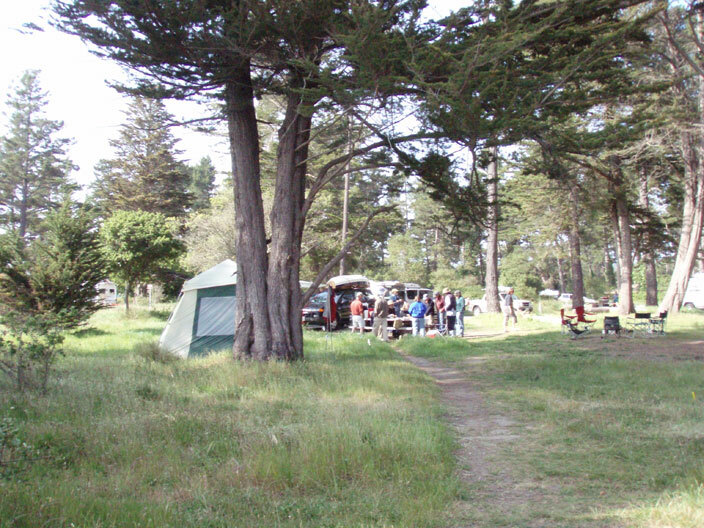 Many of us spent Friday and Saturday nights at the senic New Brighton campground in Capitola, right on the cliff overlooking the ocean. 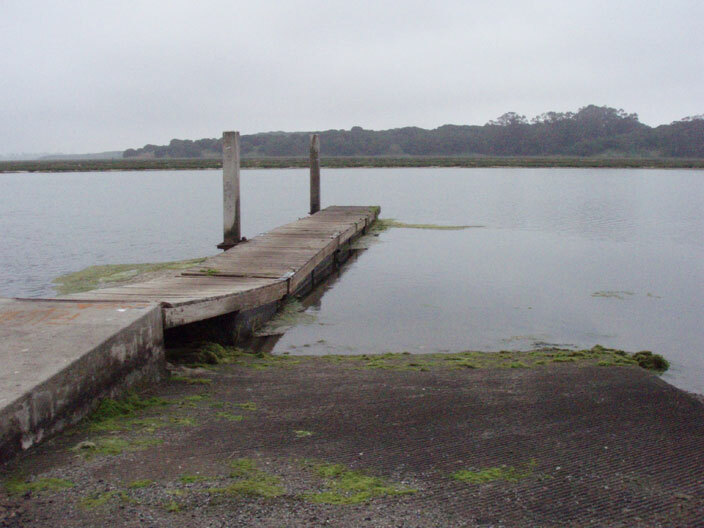 The ramp at Kirbys is weedy, but best at high tide. 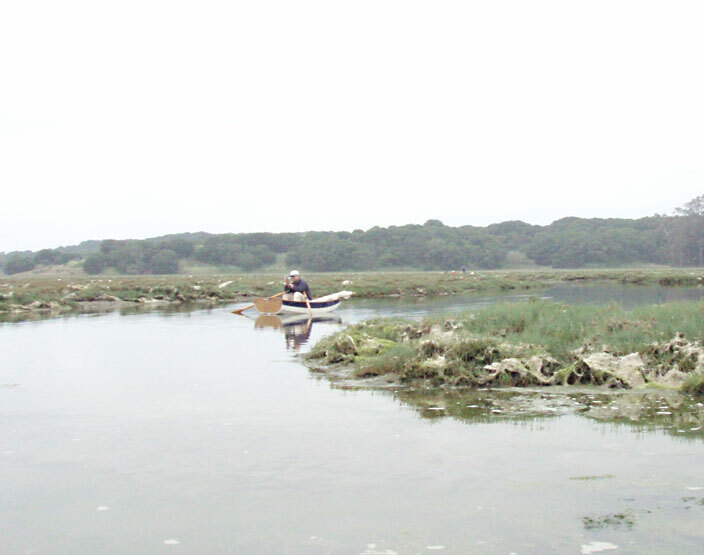 We launched around 10am with the incoming tide changing to slack water. 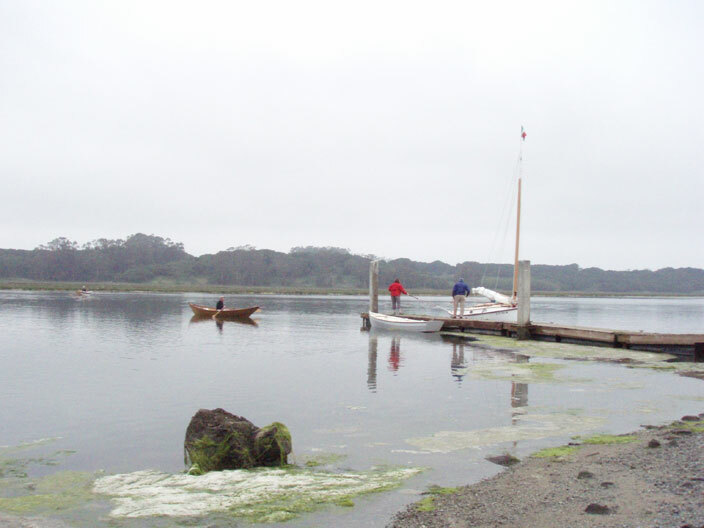 Jake, one of the hosts, sets up his lovely Old Town. 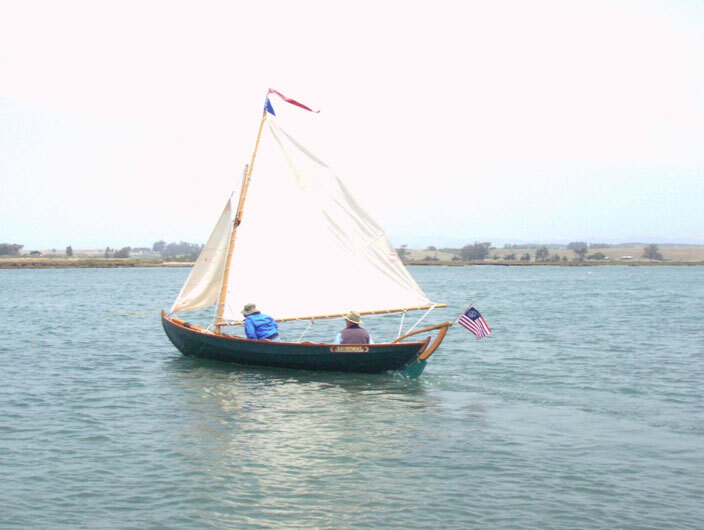 This pram used a sail rig borrowed from Jake, with my spritboom pressed into service as well. 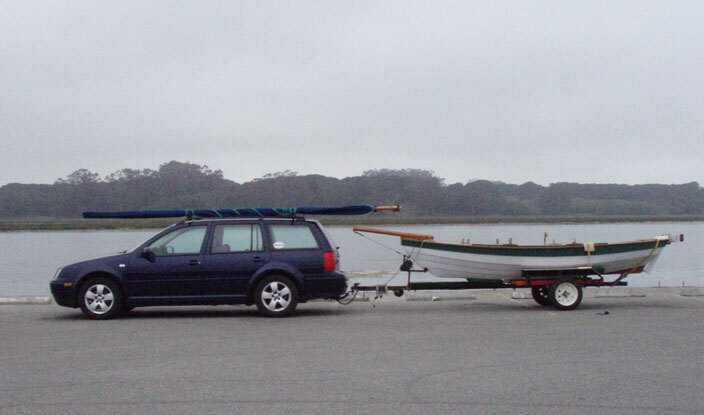 I was very excited -- this was the first time I'd towed with our new Jetta diesel wagon. 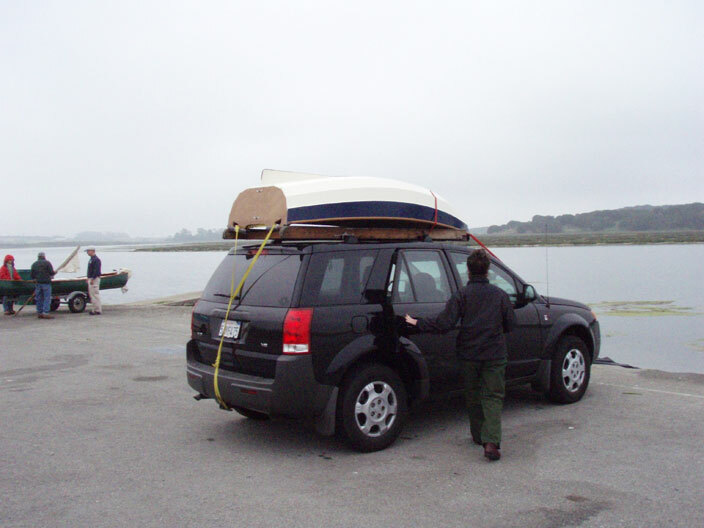 It pulled the boat over the Santa Cruz mountains with no strain, averaging 35 mpg on biodiesel for the trip! 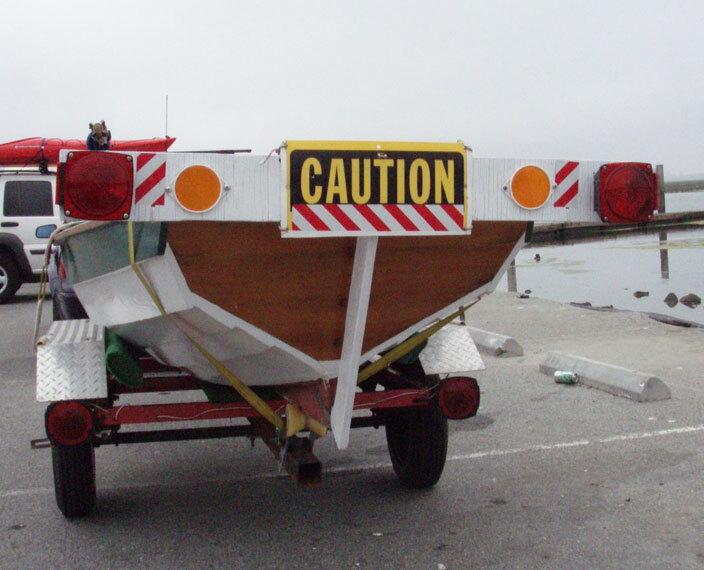 Motorists seem to respect the boat more when left no doubt as to the fact that I'm trailering at the required slower speed. 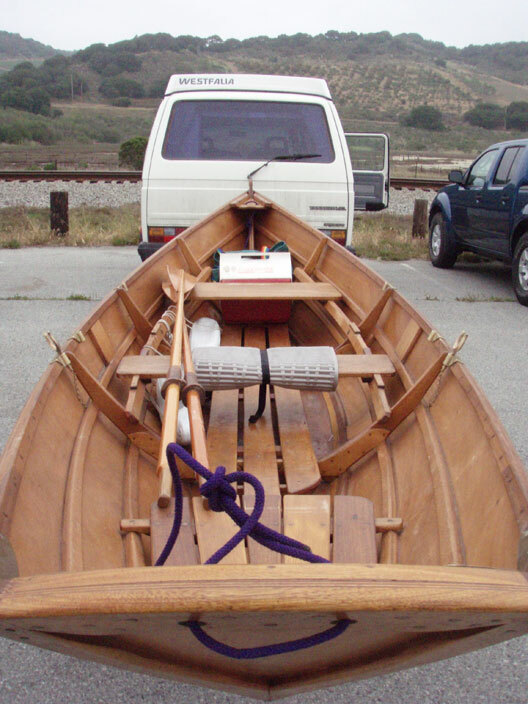 This light-bar works very well and the wiring and lights stay dry. 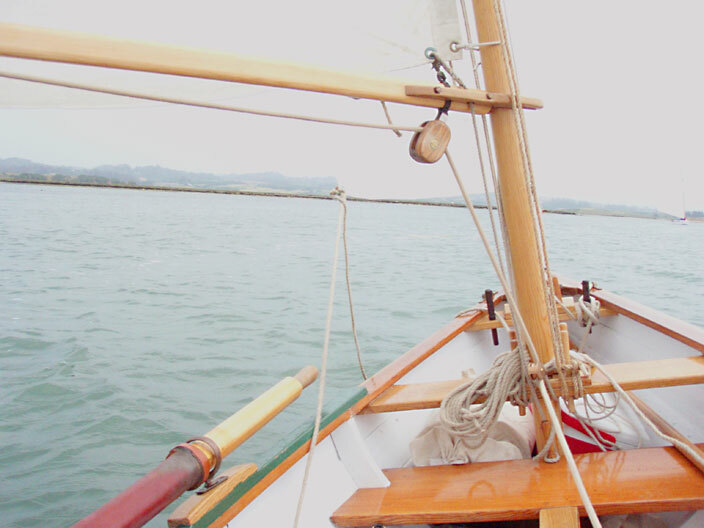 It has pintles on the vertical board which mount on the rudder gudgeons on the transom, held in place by the rudder keeper and lines from the horizontal bar to cleats on the aft gunwales. 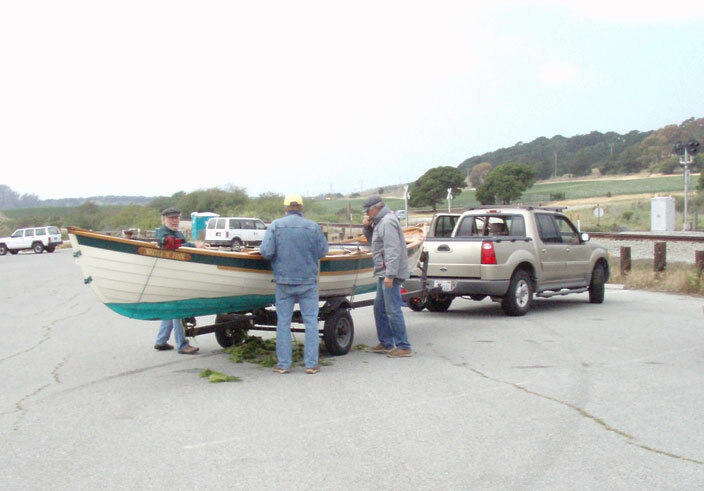 Boats begin arriving in the parking lot. 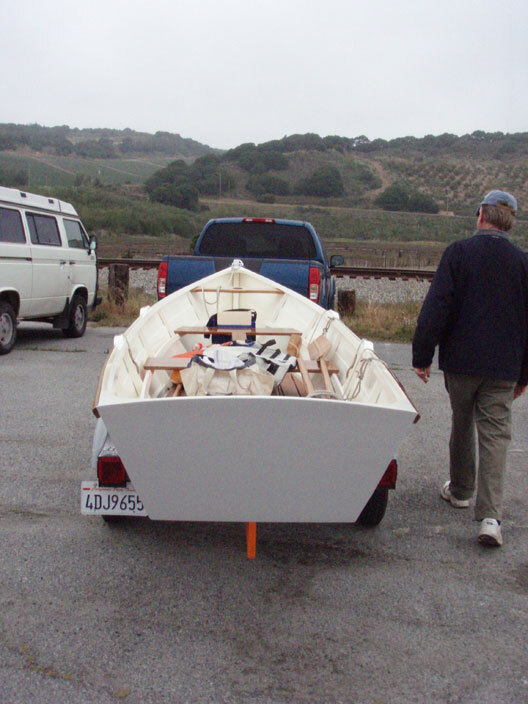 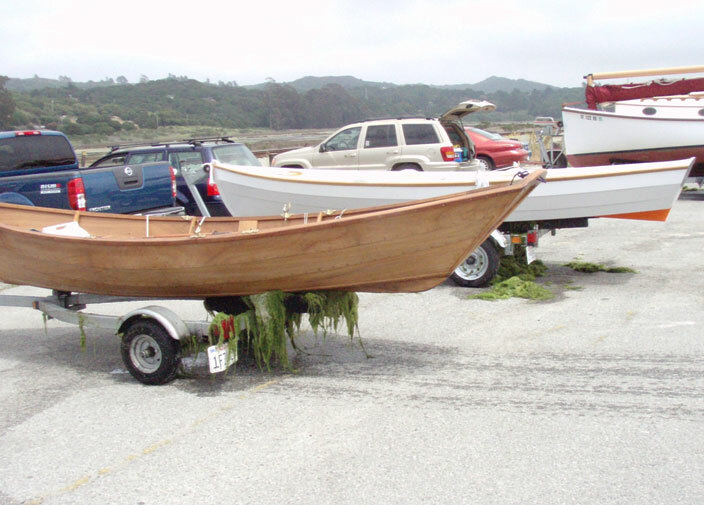 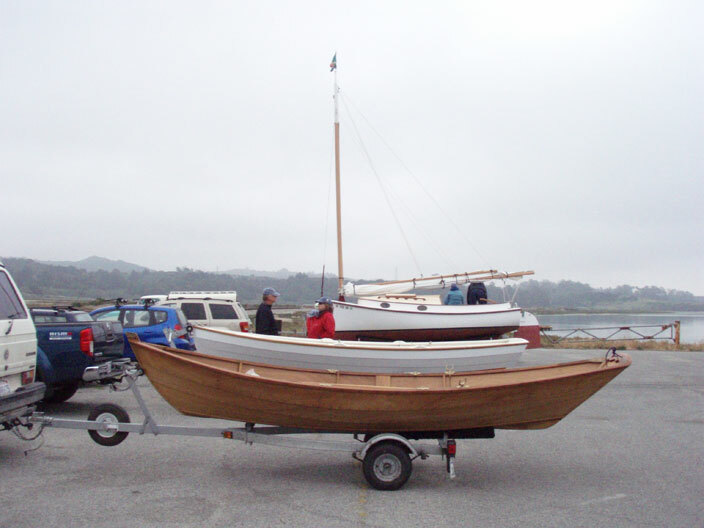 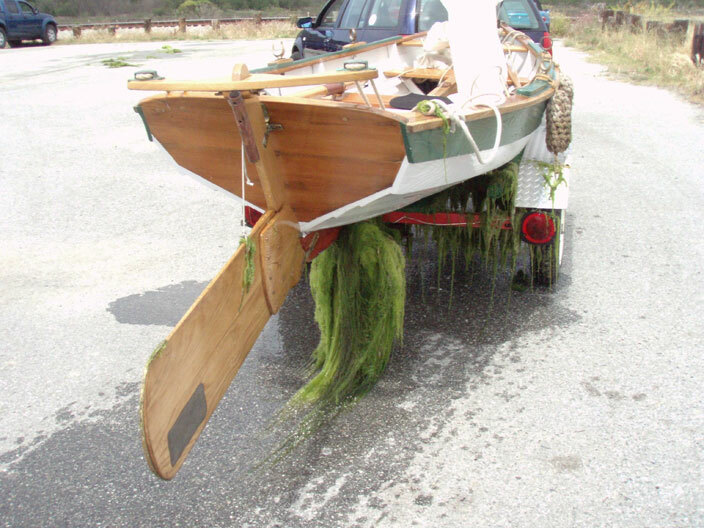 This Aeolus dory was trailered dowm from north Lake Tahoe behind a VW van. 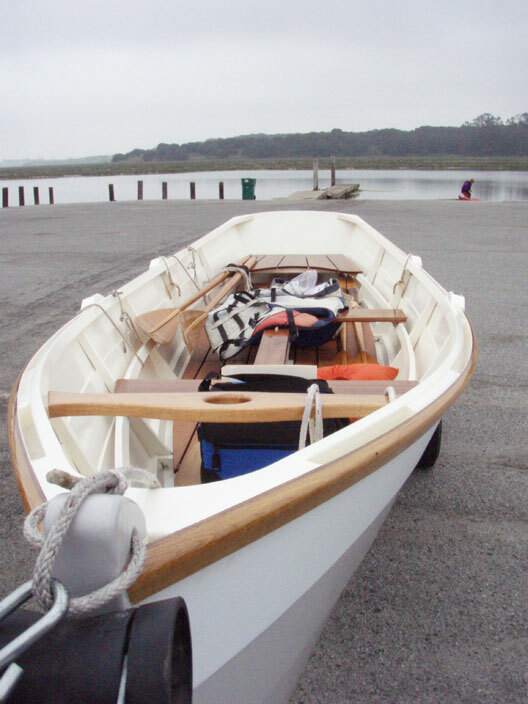 Bill Stoye's new skiff _Leaps & Bounds_ is hitting the water for the second time. 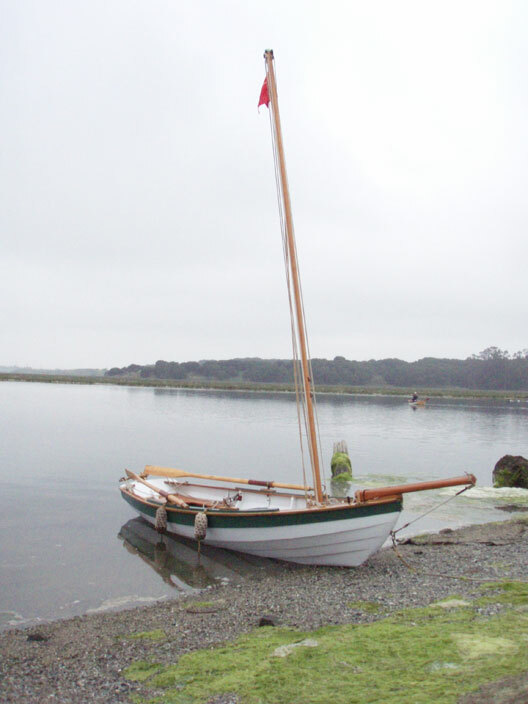 She was built by Ed Foster to plans by John Atkin. 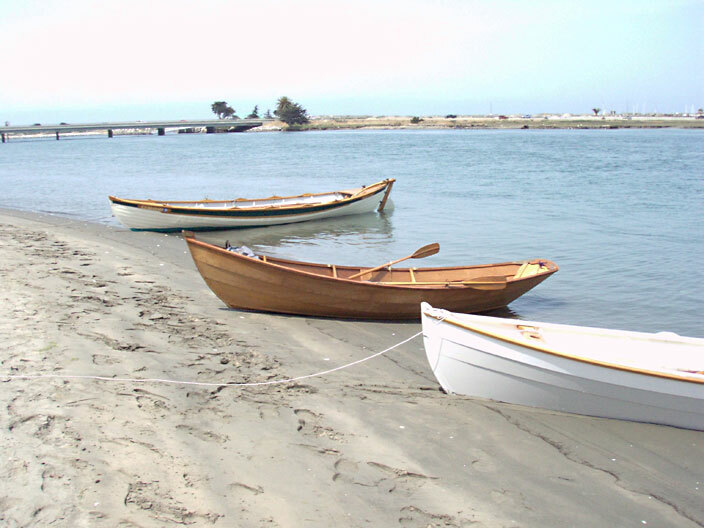 I pulled my dory up on the beach to wait for everyone to get set up and launched. 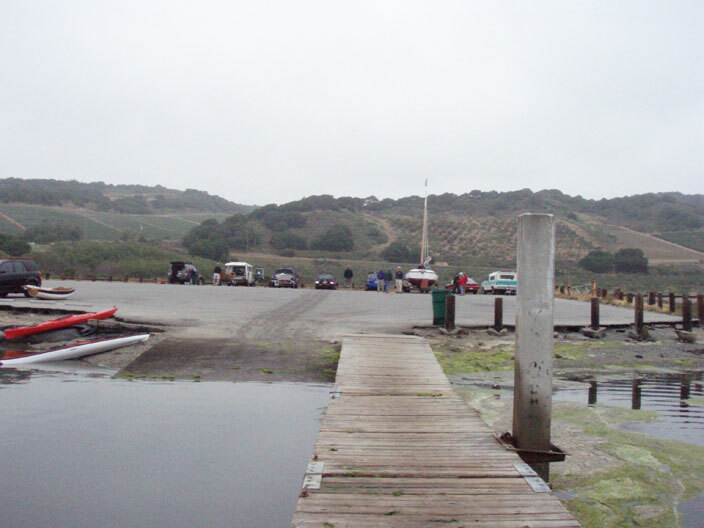 That is a sea otter floating on his back, just to the left of my mast. 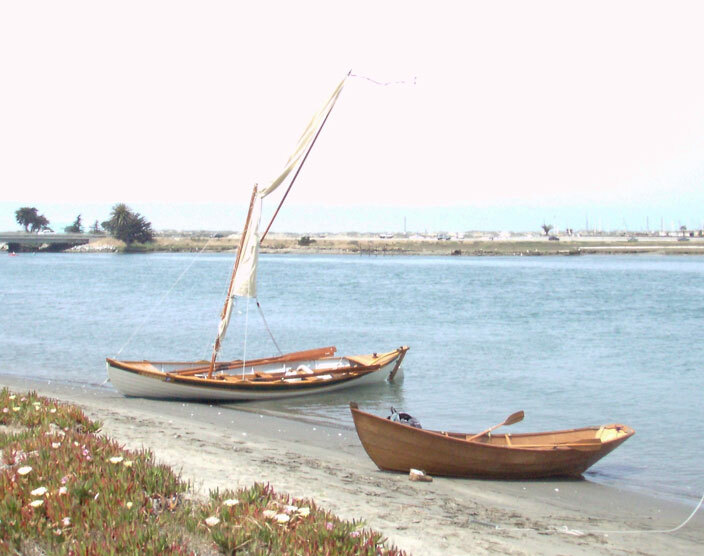 Finally we head off, and I'm quickly passed by these boats. 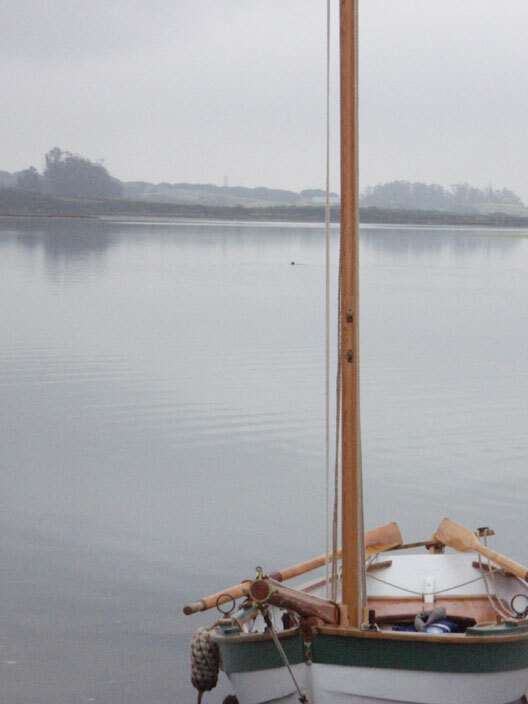 Shooting video from the pram. 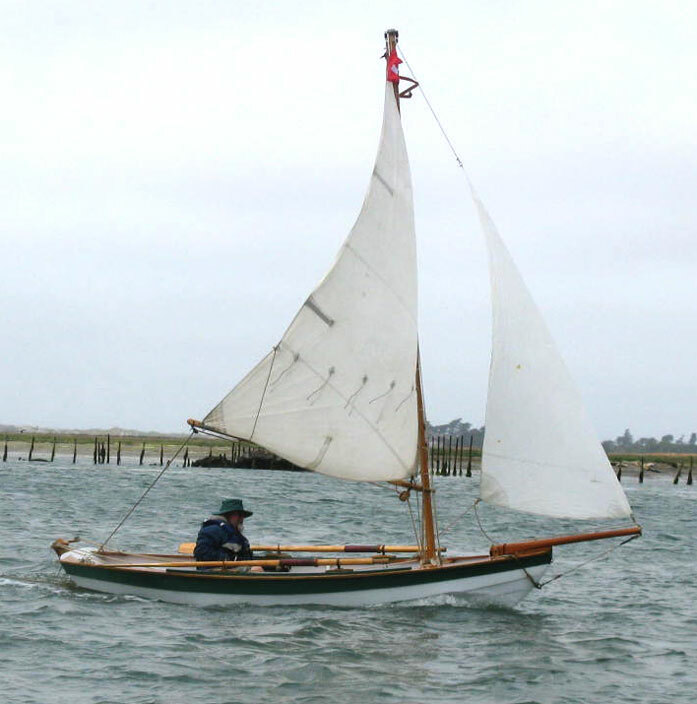 The whaleboat passing at speed! 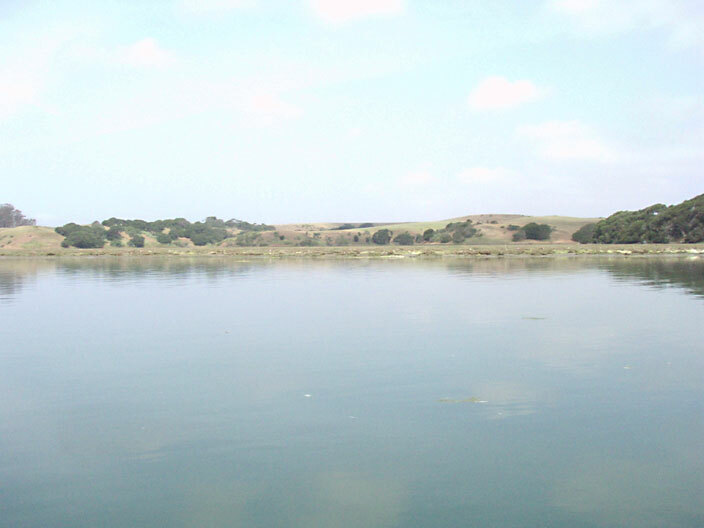 Some of the low hills surrounding the slough. 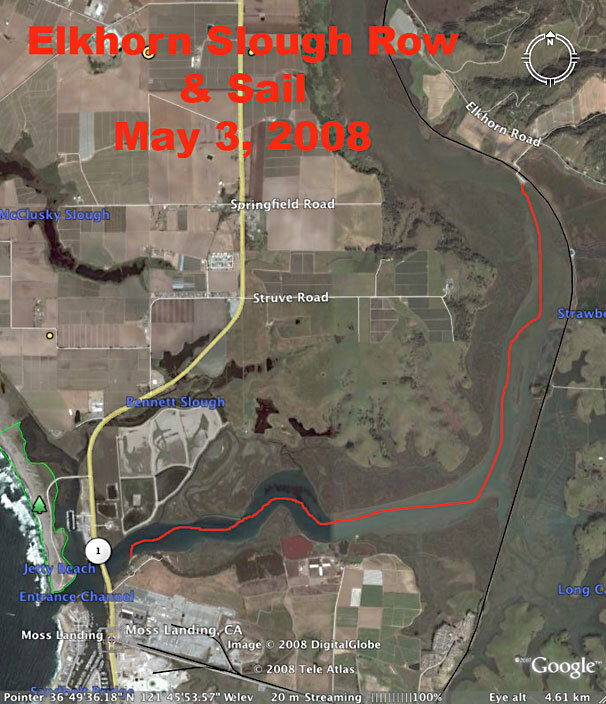 We picnicked on the small beach near the Hwy 1 bridge. 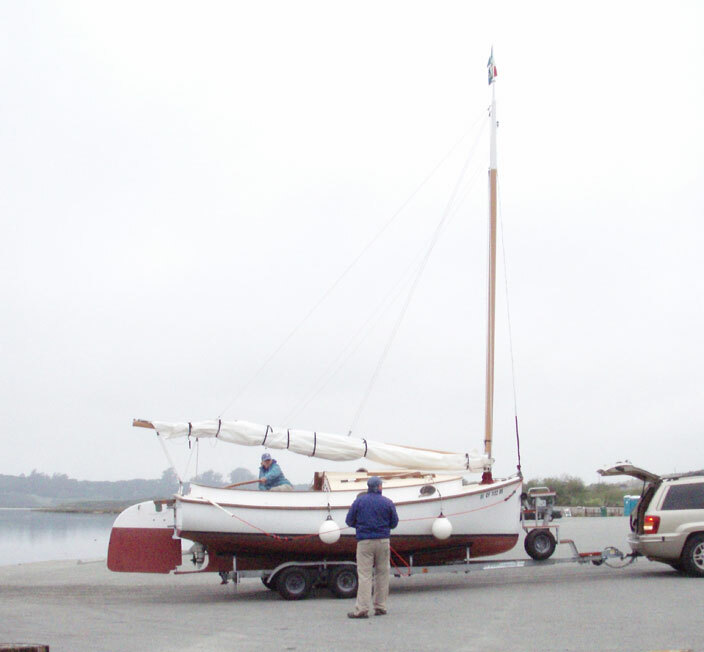 The wind off the ocean picked up as it usually does, and folks began rigging for the sail back. 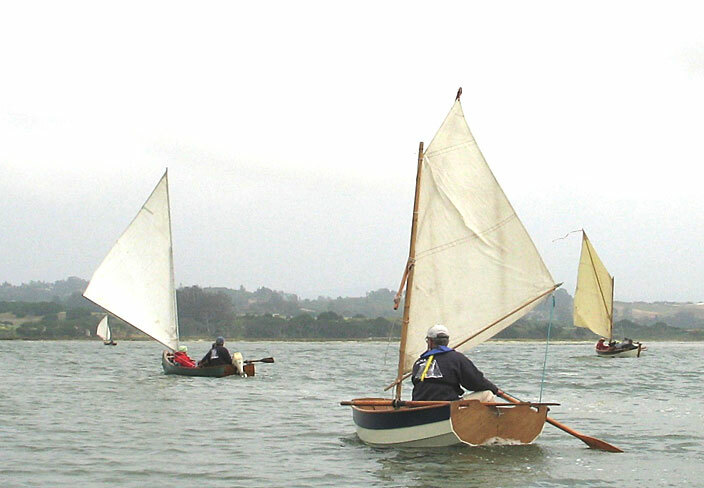 The Geigers sail off in their new double-ender. 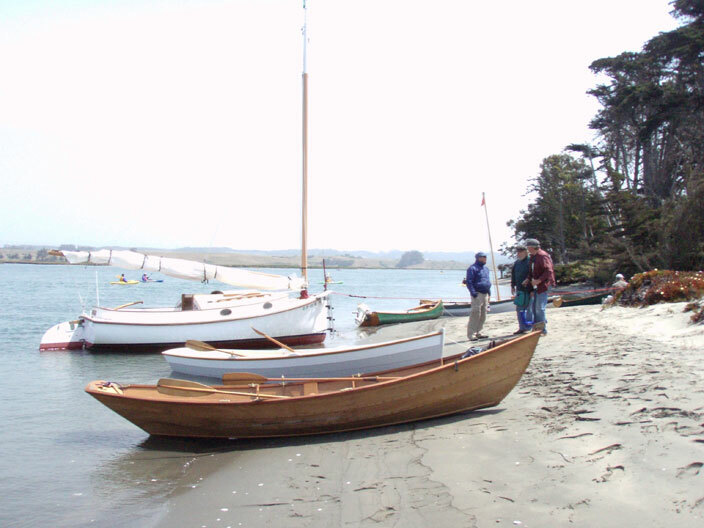 Pulling the boats out at low tide proved interesting from a botanical point of view. 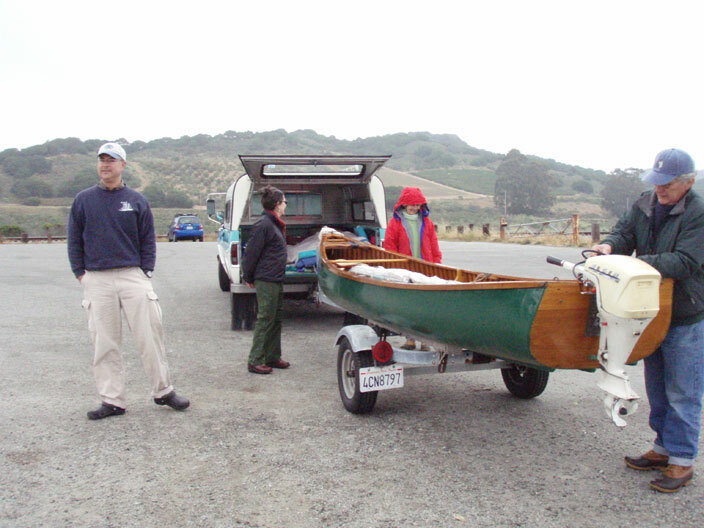 Most of us headed back up Hwy 1 to the campground. 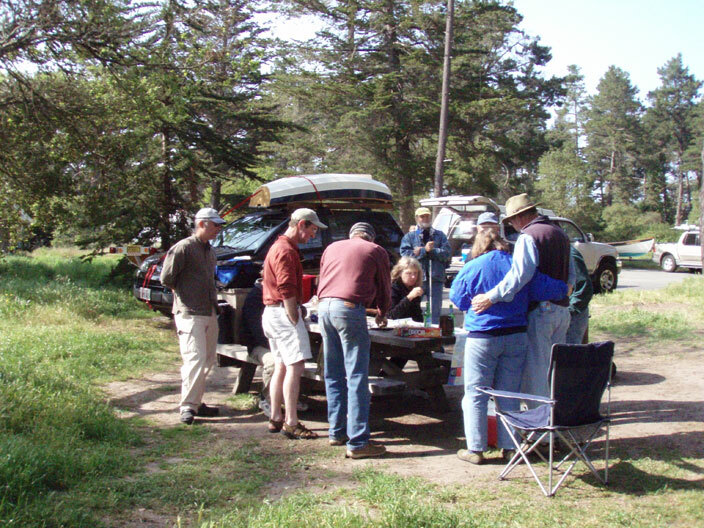 We started with home-made guacamole, went on to margaritas, Jake's great grilled salmon, and an evening of music and song.